A cute ex-musterer's hut above Timaru Creek. 6 bunks on 2 platforms. An open fire, which draws well - and firewood is abundant. Water is from a nearby stream. The floor is earthen - though a random collection of rectangles of timber make a patchwork covering some of it. 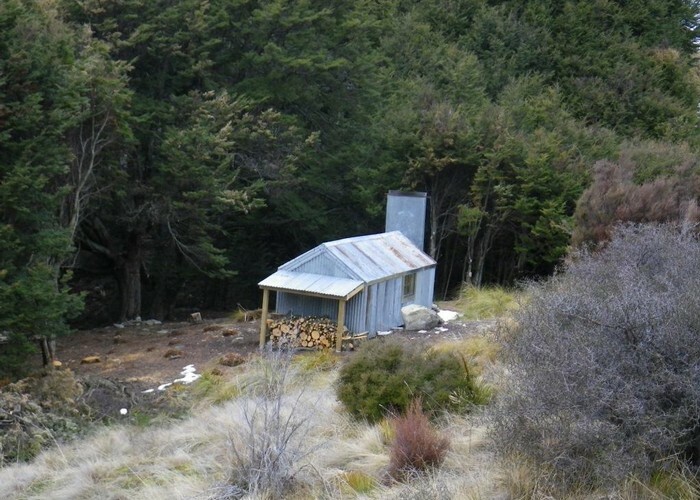 The hut lapsed out of use with the advent of 4WD tracks on the range above - meaning musterers went home at night. However, the re-routing of the lower Timaru Creek section of the Te Araroa trail past the hut has brought it a new lease of life. From the ridge above, a 4wd track runs from Lake Hawea Station to the Upper Lindis via Pakituhi Hut. A branch off this drops to the hut, though a slip 300m from the hut means it is no longer 4WD accessible. Below the hut, a well marked tramping track sidles to the ridgeline to the east, and then drops steeply to join the main Timaru River tramping track (recut in 2010). Stodys Hut • By madpom. Licence: cc by. 183 views in the past year (15 per month).